In a previous article ("Practical uses of CRM"), we talked about the various situations in which you could benefit from using a CRM. But what is the true purpose of a CRM, and how is it essential to your company? The word CRM itself can be very confusing: "Customer Relationship Management". Even though it is often referred to as a software, a CRM is also a method to manage customer relationship. To truly understand what a CRM is, let's take a simple example. 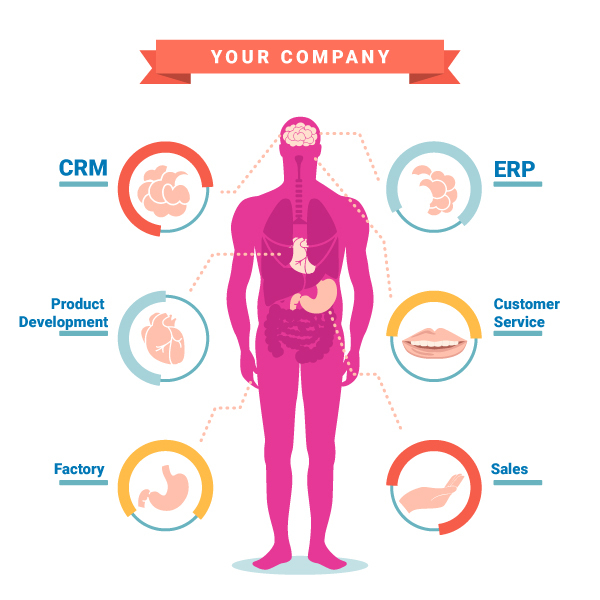 If your company were a human body, your CRM would be its brain: it contains all the customer information & knowledge. With the same logic, the hand would be your sales team, prospecting and signing contracts while sending additional information to the brain. The mouth is your customer care team (the "voice" of your company) who enriches the CRM with customer information, etc. Your CRM is an essential piece of your company since it contains the customer knowledge.
" CRM have been known to cover very different features whether it is B2B or B2C, web oriented or traditional sales, focused on acquisition, nurturing or up to quotation / ordering. Make sure to choose the one that fit your business, get help from an independent consulting firm to decide. " What should I put in my CRM? We have clarified what a CRM is. Now remains to define what it actually contains. Your CRM is nothing more than an advanced & intelligent database that records and organizes your data. Your CRM contains information related to your clients that will help you better manage them. For example, your CRM will store customer profiles. For each prospect or client; your CRM creates a new "profile" that will be completed with contact information (name, email, phone, etc. ), categories (prospect, new client, existing client, ambassador, etc. ), transaction history, conversations, etc. The information you can feed your CRM with only depends on you!
" 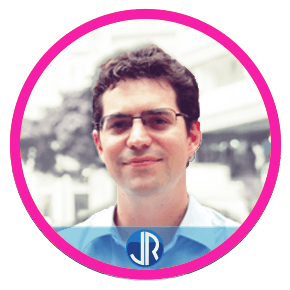 CRM will allow you to have a structure to store and manipulate your customer data but defining and refining your sales process/funnel will be at least as important as the choice of the tool. " A CRM is often managed by the sales team, considered more as a sales tool. Even though this idea may not be wrong, a well-configured CRM is much more than just a sales tool and can help multiple entities within your organization. 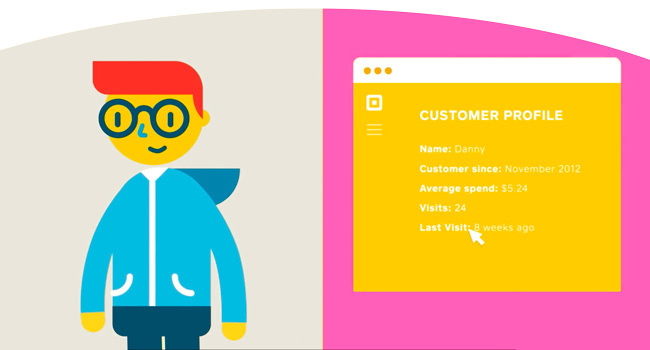 Your CRM like your brain is both sending and receiving information. It receives and organizes data from your limbs on one end, then makes that data available to these very same limbs afterward. Concretely, your sales team will add a new contact in the CRM that will then be updated when it purchases or download something. He may then contact your customer service team who would input some additional details in his profile. At that time, your financial department may access his profile to access specific information while your customer care department may read his profile to better answer his questions and your marketing team may extract details used for targeted campaigns. For this very reason, your CRM shouldn't "belong" to a specific department. On the contrary, it should be a central piece creating a bridge between all entities to help with information access. What should I do with the data in my CRM? Your marketing team may use it for targeting and understanding the audience. Your sales team may access it to extract essential profile information helping to sign contracts. 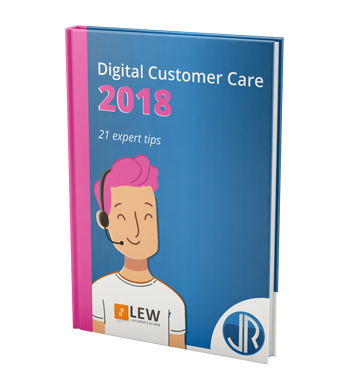 Your customer service will need it to follow easily the customer journey and better answer questions. This list could go on and on, but you got it by now, your CRM helps every bit of your company. How to choose my CRM? For a simple reason that should now seem obvious, there is no direct answer to this question. Choosing a CRM depends greatly on your usage and needs, the type of company your run and many other aspects that could have a direct or indirect impact on your choice. To choose your CRM well, you should first build a list of needs, data entry and exit points. Once you have a clear vision of what your CRM will do, you may start exploring tools to find the one that best fits your needs... and budget!
" The choice of a CRM should not be done lightly as it could easily waste you month of work and a lot of money to go for the wrong product. Do your due diligence to map your company needs, budget. Test and arrange demo to make sure you have the right product. Unless your company is very small the cost of using an independent consultant will be largely balanced by the time saving on implementation and ROI on the right product. "